Stress is something most people face on a daily basis, but it may have more of an impact than you think. Chronic stress can contribute to the development of adrenal fatigue, migraines, increased risk for heart attack and stroke, high blood pressure, and even diabetes. Managing stress, particularly every day stress, is vitally important for good health. There are many possible causes for stress, and the causes often vary from person to person. It may have been a stressful traumatic event like the death of a loved one, an injury, or a financial crisis that caused acute stress. Acute stress (short-term stress usually due to a particular event) is less harmful than chronic stress. The effects of acute stress usually go away once the stressful event is over, but chronic stress doesn’t. If you get angry and/or stressed-out every day, or several times a day, then you will likely experience many more negative affects which we’ll discuss further in the next paragraph. This chronic stress tends to cause the most problems because your body and mind never get a break from it. Getting mad and stressed out about traffic, your job, or anything else you deal with daily can have a major impact on your health, so work on letting the little things go. Stress has negative effects on nearly every part and function of the body. Chronic stress can lead to elevated cortisol levels (cortisol is also known as the stress hormone, responsible for the “fight-or-flight” response) which can cause hormonal imbalances, food cravings, low libido, depression and anxiety, and may lead to insulin resistance, diabetes, heart disease, weight gain, digestive issues, adrenal fatigue, and decreased immune system function. Stress may also exacerbate pre-existing high blood pressure, heart issues, diabetes, depresion, and anxiety. Chronic stress should not be taken lightly, and working on reducing stress in your daily life is very important. So, how is stress linked to diabetes? Our latest podcast talked about the relationship between the two, and you can listen to that podcast here. As mentioned above, stress can lead to elevated cortisol levels, which often leads to food cravings and weight gain. Some studies have shown that stress may directly raise blood glucose levels, causing your body to release more insulin to deal with the elevated glucose. If your body is consistently releasing more insulin to deal with high blood sugar from stress or a poor diet, you may start to develop insulin resistance. 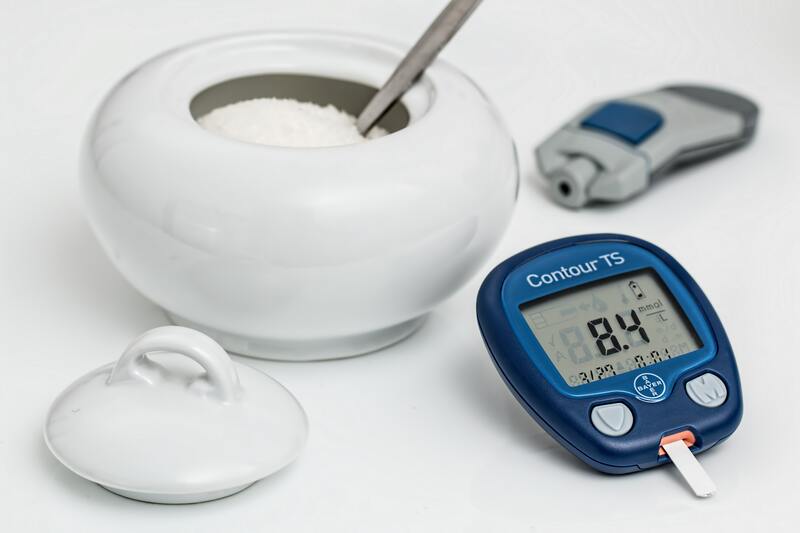 Insulin resistance is a condition in which your body essentially stops responding to insulin, leading to an inability to control blood sugar levels. Unchecked insulin resistance can contribute to the development of type 2 diabetes, so eating a balanced diet and keeping stress under control should be a priority. Cerenity – Contains vitamin B12, 5-HTP, L-Theanine, magnesium, and several other ingredients that may help promote mood stability and relaxation. CereVive – Contains vitamin C, vitamin B12, zinc, l-theanine, 5-htp, and several other ingredients that may help you deal with the symptoms of anxiety and depression. GlycemaCORE – Powder that contains amino acids, protein and fiber to help keep you feeling full. Also contains chromium which may help keep blood sugar levels balanced. Reacted Chromium – Contains chromium which may help keep blood sugar levels balanced. Stress is something we should always work on reducing, especially in our daily lives. So, practice some stress-reducing techniques like yoga, meditation or exercise, try out some supplements, eat a healthy, balanced diet, and learn to not sweat the small stuff.